If the data are not available in CSV format, you have the possibility to export the data with a spreadsheet program such as Excel. Select the files to be renamed by using the file-selection dialog. Alternatively, you can add files via drag and drop onto the program interface. 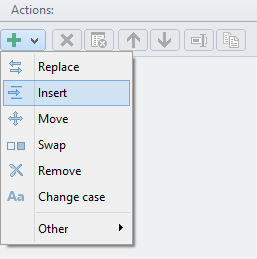 Click on the button featuring the plus (+) symbol and add the action Names From CSV File to the action list. In the example shown, the CSV file is structured as follows. The old file name is contained in column one of the CSV file and the new name will be composed of the columns two and three. As CSV separator, the comma was detected automatically. The columns for the old and new file names were specified accordingly. Rename Expert tries to detect to CSV separator automatically. However, this is not always possible. In this case, you can open the CSV file with a text editor such as Notepad to see, with what separator the columns were separated (usually with a comma). The separator can then be manually selected in the program (as shown in the figure). The new file names are displayed in real time in the preview list, enabling an immediate review. Provided that no conflicts exist, the Tasks dialog can now be opened by clicking on the Apply button. All files and folders to be renamed are listed there, and the renaming process can be started by clicking on the Start button.